Right now we have a giveaway going on for a Celestial Effects Aries Beast Distortion. The response has been great and we still have more to say about this one-of-a-kind builder, so we decided to extend the giveaway until February 3rd, 2016 at 2PM MST. 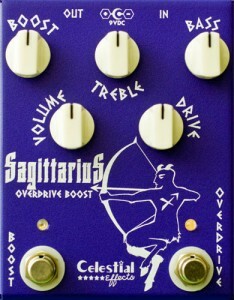 If you haven’t entered to win this pedal, you now have time. So click that link at the bottom of this post to learn about the three ways you can gain a chance to put the Beast on your board. Celestial Effects is located in Hudson, Massachusetts, home of many notable people such as William Coolidge (physicist who invented an improved x-ray tube and the tungsten filament for light bulbs), Nuno Bettencourt (lead guitarist from the band Extreme) and Charles Precourt (retired US Astronaut). How many pedals in their line? Celestial Effects currently has 9 pedals in production with 3 more ‘coming soon.’ As their name suggests, all the pedals in their name relate to a sign in the Zodiac: Scorpio Boost, Aquarius Fuzz, Virgo Rock Overdrive, Capricorn Rock Distortion, Taurus Blues Overdrive, Aries Beast Distortion, Sagittarius Overdrive Boost, Gemini VTR, Cancer Wah the Fuzz, and (the coming soon pedals) Pisces Coral Waves, Libra Supernova Compressor and the Leo Tube Overdrive. How do you start on a new pedal? 1. Idea creeps into my head. 2. Circuit is conceptualized on paper that “should” sound like a tone I’m trying to emulate in my head. 3. The circuit is bread boarded and tweaked and usually morphs with more flexibility than what was originally thought of. 4. I lay out the circuit and in parallel design the enclosure. 5. Circuit board comes in and is built and tested. If no mods are needed we proceed in making a project file for the design which includes Bill of Material, layout, build procedures, testing procedures, case design and drawings, screening design and drawings and procurement of special parts. 6. We then order parts for a prototype run of 20 pedals and distribute them to our team of “testers” for feedback. The point is, there is a ton of information out there about CE and for good reason – musicians are drawn to their effects. Just check out the list of guitarists and bassists who use their gear in their own bands and you’ll get a sense of their popularity. So, instead of treading familiar territory and rolling out the same questions, we asked the folks at Celestial to come up with 10 items they thought we might not know about them. Joe Grein was kind enough to find the time to put this list together. So without further yammering – here is the list! Thank you Thermalogic Corporation: Celestial Effects is owned by Thermalogic Corporation, which has been designing and manufacturing electronic temperature controls and sensors since 1971. Thermalogic products are used in many places worldwide such as Amtrak, Pizza Hut and US Army, just to name a few ! 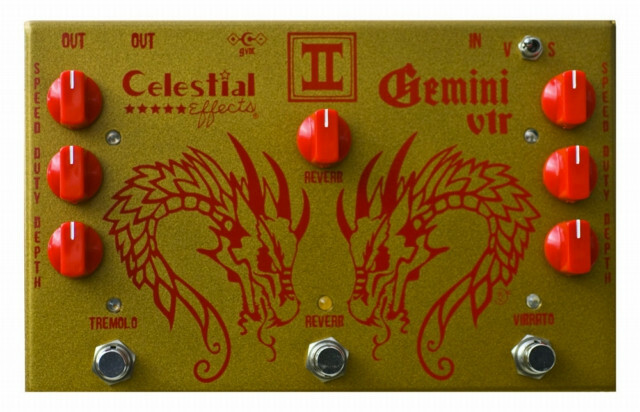 First Two Pedals: Dom Mancini is the chief design engineer at Celestial Effects and Joe Grein is the President, handling the Marketing end of things. 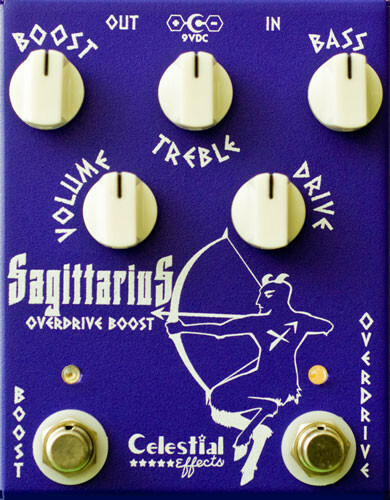 The first 2 pedals released by Celestial Effects were the Taurus Blues Overdrive and the Scorpio Super Boost – because Joe is a Taurus and Dom is a Scorpio. Musical Background: Joe does not play guitar! He does play keyboards and had a surf, blues, secret agent band called SPY in the 1980’s. When Things Get Tough…: Dom has been making pedals and modifying amps for friends for over 25 years. It was Dom’s idea to approach Joe about starting Celestial Effects during the “great recession” of 2009 and Joe went for it! All in the family: Scarlet Star (the tone goddess in Celestial Effects’ demos) is Joe’s wife and the one who thought of the name Celestial Effects . The idea came from her affinity for creating astrology charts. She works in marketing for Thermalogic and Celestial Effects in addition to being a vocalist. The Artist! : Kate Donahue is in the production department and is also the artist for all Celestial Effects pedals. She has been heavily influenced by Japanese anime. She also designed the Celestial Effects logo. Same Interests, Different Times: Joe’s brother Lou, who is an electronics genius, designed and made his own pedals when he was a teenager. Little did he know that one day his brother Joe would be in the pedal business. You’re Funking Kidding Me?! : The first major artist to approach Celestial Effects was Mark Farner of Grand Funk Railroad. Mark is a big advocate of “Made in the USA” and this is what attracted him to Celestial Effects. The “We’re and American Tone” tag line used by Celestial Effects is a play on words of a well know Grank Funk Railroad song. Locally Grown: Celestial Effects does the vast majority of everything in house, including design, manufacturing, web design, photo shoots and order software. Only the case manufacturing and powder coating is done at external vendors. So there you have it. Some great tidbits and fun facts about one of our favorite pedal builders. 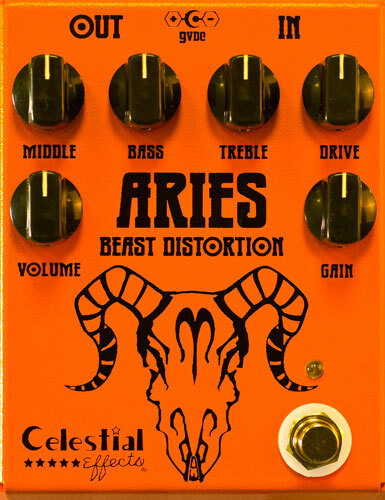 If you haven’t already, like them out on Facebook, check out their website and for heavens sake – ENTER TO WIN THEIR ARIES BEAST DISTORTION. Then go watch that “A Moment with Dr. Rokkentone” video again!